I'm willing to put most things on pizza. Any variety of meat, most vegetables, fried eggs, even the collected works of Shakespeare goat's cheese are all suitable toppings for pizza. Really, pizza is quite fair game... except for fruit. Fruit doesn't suit pizza (other than tomatoes, smart-arse. If they count as fruit, I don't even know anymore). I can't put my finger on it entirely, admittedly, but I think it has something to do with warm, squidgy fruit tasting like suffering when mixed with fried cheese and delicious ham. And yet, ham and pizza is such a ubiquitous topping. So much so that when I worked at Pizza Express, people would ask why there was no ham and pineapple pizza on offer on the menu and ask if the chef could prepare one. Of course, the chef couldn't because Pizza Express makes good pizza and doesn't keep pineapple in stock. The outrage some people expressed at this was baffling. Just get the pizza with fried egg on it, you slack-jawed pizza urchin. Call this pizza-based elitism, but you know I'm right. 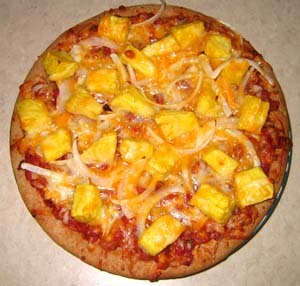 Pineapple is not an authentic Italian ingredient for any pizza, but more than that, it tastes horrible. It doesn't belong with melted cheese and it definitely doesn't belong alongside cooked meat. How anyone can stomach that abomination without retching up a yellow splurge stuns me.